One of the primary ways to control crab grass is through use of a pre-emergent herbicide. But if you plan to overseed your yard with new grass, you won’t be able to use a pre-emergent herbicide because it will prevent grass from germinating. You will have to resort to other methods to kill crab grass before overseeding your lawn with new grass. Apply a nonselective herbicide such as glyphosate or 2, 4D directly to the crab grass to kill it. These herbicides frequently come with a spray applicator or one in which you can paint the herbicide directly onto the leaves and stems of the plant. This will prevent you from killing the surrounding grass. Wait until the crab grass has died. The grass will turn brown and papery. Remove the dead crab grass with a hoe near the base of the plant. Continue to remove crab grass throughout the summer when it emerges. Wait until fall to overseed your lawn. Create furrows in your lawn with a garden hoe so grass seed will reach the soil and germinate. Rent a verticutter from a heavy equipment or lawn care store. A verticutter cuts vertical furrows into a large space, such as a large lawn. The machine operates similar to a mower in that it is pushed over a lawn in sections. Set the verticutter to cut furrows 1/8-inch deep. Fill a broadcast spreader with seed. Push the spreader over your yard in sections. Water your lawn to help establish seeds. Try to water every two days to the point that the top two inches of soil is as wet as a wrung-out sponge. Repeat this process for approximately two and a half weeks. Then decrease the frequency that you water your lawn to once per week and increase the amount of water that you use in each watering session. You should have an inch of standing water on the surface of your soil when you finish watering your lawn each time. Cover your lawn with a ¼-inch layer of peat moss to help protect the seed. 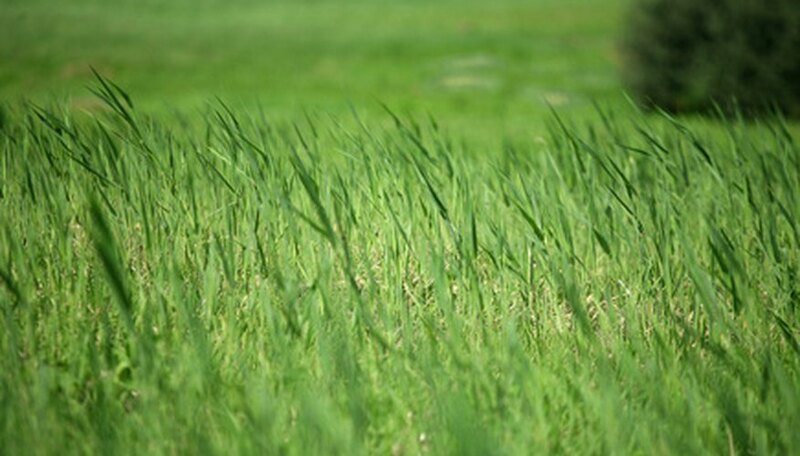 Any remaining crab grass will be killed after the first frost, while your grass seedlings will produce roots through the winter. Purchase weed and feed in the spring at the same time azaleas and forsythia are in bloom. Spread over your lawn using the spreader. This will fertilize your new grass, while at the same time preventing the germination of crab grass seeds. Always wear gloves and protective clothing to avoid skin contact with herbicides. If applying a granulated herbicide or fertilizer, wear breathing protection to prevent inhaling dust.